Central library has well furnished reading hall for the students. Separate section for faculty members has been provided. The library is located at calm and quiet atmosphere. A Library plays a vital role in any education. Our Polytechnic has latest and best possible books, Magazines, Journals and news papers for the student and faculty members. The students use these books for their academics, General Knowledge etc. Library has one of the best and wide collections of related Academic books and Journals. Our Library staff takes care of each and every student by availing them with best of their requirements. 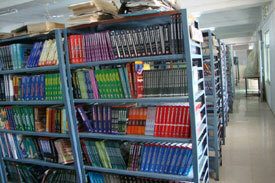 Large Number of Text books and Reference books. Titles – 6632 Volumes – 33674 & There Cost is Rs.50.71 Lakh. All Library Operations are automated using with Bar-Code Technology & SOUL 2.0 Software i.e. Circulation, Cataloguing, Database maintenance & Opac search etc. Good collection of CD’s on General Knowledge. 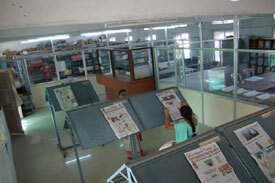 Book bank facility is available for the meritorious and SC/ST/SBC/NT students. Subscribing 9 International, 18 National Journals & 9 News papers. Available Internet facility for student to access Reference work. Spacious reading Hall for Boys and Girls.